Albion Accounting Services can manage all payroll on a weekly, fortnightly or monthly basis. Our payroll services in Yeadon include producing payslips for your staff and details for your business accounts. PAYE will be prepared on a monthly basis for the Inland Revenue and year-end returns and accounts from P14s, P35s and P60s will be submitted for you by our team. We always offer a comprehensive service, ensuring all accounts and returns are managed correctly. We offer a number of payroll services in Yeadon, initially taking all account and wage details of your staff members. All payslips will be produced with the correct payment, along with any additional bonuses or reductions that your staff have accumulated. 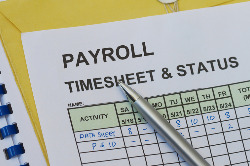 A payroll schedule suitable for you will always be organised, ensuring we never miss the deadline for when payslips should be available and that your staff also have easy access to this payslip. Using the latest payroll systems, this allows us to complete payroll with simplicity, whilst ensuring accuracy for your staff members. Regardless of how frequently you would like your payroll schedule, our team can always meet your needs for any number of staff members. Pay-As-You-Earn systems are always used by our team to deduct the correct income tax and national insurance contributions from your staff. We ensure all staff have an accurate pay whilst meeting legal requirements. By using our team, you prevent staff from ever being deducted too much money through tax and national insurance contributions. Our team have a great understanding of all taxes and will always deduct the correct amount on a monthly basis, potentially saving your business money. If you would like more information on the payroll services we have available or want a quote for our services, contact Albion Accounting Services today. We can advise you on all payroll processes and schedules, giving you a simple solution for payroll in Yeadon, Bradford. Call us today on 07989 627017 or fill in our contact form to make an enquiry.